Wendy is a "Mitzvah Find" on Mitzvah Market. 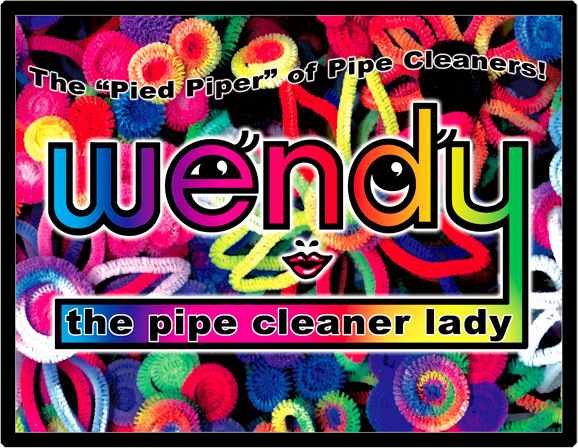 Wendy Baner, the Pipe Cleaner Lady is always a huge hit at our events. You can hire her for bridal party showers, birthdays, any celebration, she can make anything out of a pipe cleaner! This is a Flickr badge showing items in a set called made by wendy. Make your own badge here. 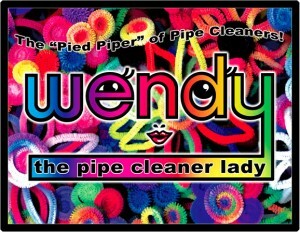 Wendy … the Pipe Cleaner Lady! Wendy catches everyone’s attention the moment she arrives wearing her unique handmade sparkling costume, along with her cart with it’s flashing lights and a sampling of Wendy creations. The cart carries her Party Bucket filled with an unparalleled assortment of pipe cleaners. The selection includes twenty regular colors, plus multi striped, glow in the black light, sparkles, mini’s and the most popular, Wendy’s famous signature tie dyes. Hanging off her cart are pre-made beads, sparkle hearts and stars, and pencils. All used to create all kinds of fun and whimsical and wearable creations. 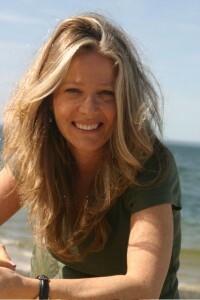 Wendy works interactively with children and adults alike teaching her new creative craft. Step by step they build on their skills starting with her famous daisy ring to learn the basic’s and gain a sense of accomplishment before moving on. Once they do the ring and love it they are willing to try something harder. If they skip the easy project and move on to something harder too soon, they will become discouraged. When done Wendy’s way, advancing and building on their skills, before they know it they are doing what at first they thought only Wendy could do. The next day all the moms tell Wendy that they had to go out and buy pipe cleaners. Everyone says, “who knew you could make so many cool things out of pipe cleaners?” It’s a clean quiet craft that everyone loves, boys and girls alike, from ages four all the way up to Grandmas and Grandpas. It’s really indescribable if you haven’t seen Wendy in action. Her charisma is magical as she captivates and inspires creativity in all. Always the positive thinker, “I can’t do it”, is unacceptable, to her, she WILL prove you wrong. Wendy has taken plain old pipe cleaners, now called chenille stems to a whole new level. She is a one of a kind entertainer whose love and enthusiasm for her craft is contagious. The kids can’t believe that she made it all up and made it into a successful business. She tells them to do what they love and believe in their dreams. They love her and want everything she makes and wears. They want to take home her hat, necklace, earrings, belt, bracelets, and her purse, incidentally, all made out of pipe cleaners. There was even one group that chased her out to her car and tried to go home with her! She is truly The Pipe Cleaner Lady. She always leaves them with smiles on their faces, lots of new pipe cleaner creations to take home, and a new love of pipe cleaners to last for a life time.